*Sign up for Swag Bucks here. You should receive 30 Bucks to start you out. *Start doing your online searches through Swag Bucks. I type in the names of sites I go to all the time like facebook.com, blessedbeyondriches, and ect. in my toolbar. Every now and then I earn Swag Bucks. Swag Bucks are random, you never know when you will get one for doing a search. I usually earn about 20 to 30 Swag Bucks a day. Not bad for doing something I am already doing. *Promote Swag Bucks: Did you know that if you invite your friends to sign up for Swag Bucks when they earn bucks so do you. You can earn up to 1000 Swag Bucks for every person you invite to join. Bucks can add up quickly with a few referrals. This is a great week to invite friends! *Make sure you add your birthday to your account Swag Bucks will give you 50 bonus bucks on your birthday! *Trade in your Swag Bucks for Gift Cards or Prizes. 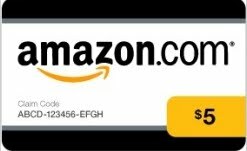 For example: 450 Swag Bucks = a $5 Amazon Gift Card. There are lots of prizes and gift cards to choose from. I just happen to prefer the Amazon gift cards. That is pretty much all there is to it. Yes, I am a swagger! I use the Amazon gift cards as either mad money or like I said to help pay for Christmas gifts...and it's great! !